Amara is one of the newest condominiums located right on the beach in the center of the hotel zone. This fourth floor condo provides spectacular views of both the ocean and the mountains. This 2200 sq. ft condo has two master bedrooms facing the ocean and two queen bedrooms facing the mountains. Each bedroom has its own bathroom. There is a full ocean view living room and dining room with ceiling to floor glass sliding doors that open to a fresh ocean breeze. A dining table and chairs are on the deck for your outside dining. There is a full kitchen with attached maid service quarters with twin bed, bath and full-sized washer and dryer. All water is purified so you can take chilled water and ice from the refrigerator or tap with confidence. Daily maid service is available upon request. The outside area has three private pools; two infinity pools and one children's pool. There is a private beach entrance (security watched) where you may enjoy sunbathing, swimming or long walks on the beach. A variety of water sports are available right as you walk out on to the beach. Shopping and great restaurants are within walking distance. Visit Ixtapa, the Ultimate Paradise! We are a family of five who have been vacationing in Ixtapa for 20 years. Our children grew up with the fondest memories of all that Ixtapa has to offer. We find it to be the most beautiful place on earth! In 2008, we decided to purchase a piece of this paradise for us to continue enjoying with our growing family. 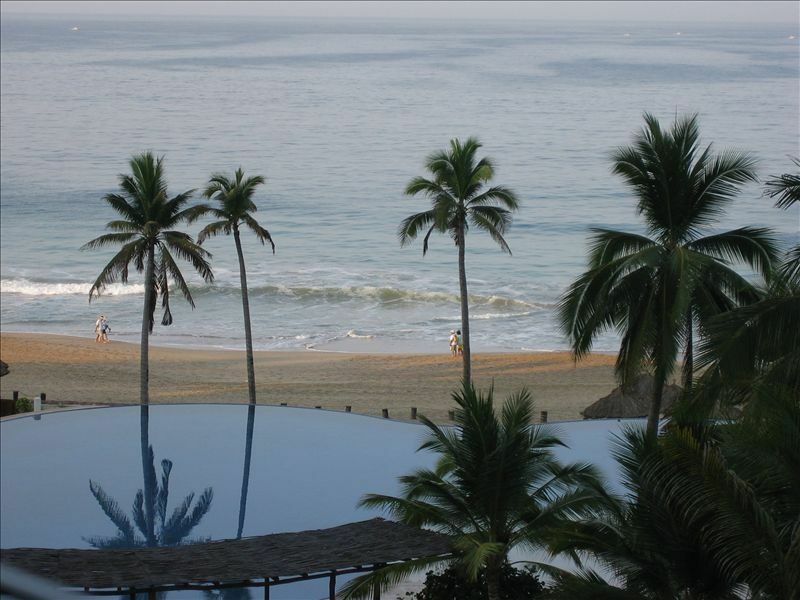 We chose Amara Ixtapa because of Ixtapa's beautiful weather; bright sunny days and magnificent sunsets. Amara is centrally located on the beach and we enjoy the full ocean view from our condo. We enjoy walking the beach, swimming in the beautiful pools, and dining in the local restaurants. We also enjoy dining in the many restaurants with spectacular water views. The view and location were perfect! We really enjoyed the beach, pools, and location to bike path, restaurants and shopping. The unit had a few maintenance issues that were mostly looked after while we were there. We had issues receiving checkin information but not sure what the cause was (email?). As well we were not advised of additional fees required for our ID bands and final cleaning fees when we booked . The pools and beach were not very busy so had no problems getting lounge chairs at any time of the day. It would have been nice if the loungers on the beach had cushions. We would have liked full tennis courts and a BBQ but we made use of the courts next door with Claudia’s help. Claudia is amazing! She looked after all our questions, tennis bookings, taxi, maintenance issues, maid, chef and responded right away. We really enjoyed the chef that came in and cooked an authentic Mexican meal for us. Overall we had a fantastic vacation! |Overall very nice, don't like that people go and put towels on the pool chairs at 8 in the morning but don't come and use until 4 or 5 hours later, therefore not allowing someone else to use in the meantime. Great location, and close to lots of restaurants and little stores. Great Beach, and people very friendly. This was a great place to spend our time in Ixtapa. It was clean and had everything we needed. The view from the balcony is fantastic and the A/C in every room except the maid quarters was nice too. We had maid service come in every three days and a cook come in three nights. Both of these services were wonderful and exceeded our expectations. We have raved over and over about our cook. The three pools and beach access was incredible. We were there during a busy time, so there was restriction on number of lounge chairs we could use by the pool and at the beach. Every time we went to the pool or the palapas on the beach, there were lounge chairs "reserved" with towels draped over them, but a large majority of the time the chairs were not ever occupied by another human being. The food and drinks are not very good at the little bar at the property, but it sure was nice to have it available by the beach and pools if we didn't feel like running up to the room. Overall, we were very pleased with our stay! Our family just returned from our stay at Kevin's Amara condo. The condo is huge and beautifullyy furnished. It has everything you will need for your stay. The view of the beach from the deck is perfect. OF course the sunsets are amazing. The staff is very helpful and friendly, and the pools are clean and refreshing. You are steps away from the pools, a cool drink or snack at the palapa, and a few more steps to the amazing beach. Hotel sucurity is tight, which we loved. We would love to stay here again in the future. Kevin will take care of you before you leave, and the staff at the Amara will help you once you arrive w activities or any help you may need. Wonderful resort with a really friendly clientele,which makes for great socializing.Well equipped unit with a view that is better than the pictures indicate.Attentive,and accommodating owner.What more could one ask for ? Loved our short stay,will be longer next time ! The Amara is a great location to be able to walk into Ixtapa for dining & shopping. Plus the oceanview is great from this condo and an easy walk to the pools and ocean. We never had a problem getting a lounge chair at either spot, any time of the day. Definitely an easy place to stay and the condo is roomy and nice to have extra bathrooms when we were all getting ready at once (equipped with hair dryers - once less thing to pack:-).